Today Apple made iOS 10.2 available for supported mobile devices, and that release comes with the new TV app built-in. Since that works (only in the US right now) for owners of the Apple TV, it's not surprising that the company's TV box is receiving a software update too. tvOS 10.1 is now rolling out, and yes, it too has the new TV app inside. This lets you easily find content to watch, regardless of which provider app hosts said (movie or TV show) content. It's also a repository of your past purchases, again regardless of which app you bought what from. Furthermore, the Apple TV now has single sign-on support for your cable provider, so you can authenticate with that company and instantly unlock access to all compatible video apps. The new iBooks StoryTime app brings children's books to the biggest screen in your house. 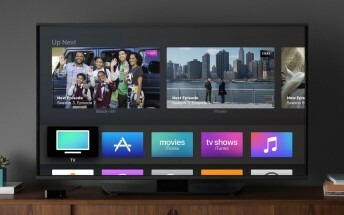 The tvOS 10.1 update is available for the fourth-generation Apple TV.